DO SOMETHING FOR YOURSELF TODAY…END THIS COMPULSION ONCE AND FOR ALL…BEFORE IT ENDS YOU !!!!! Hypnosis is effective in changing many behaviors. Compulsive lying is a problem for millions of people and one that can cause them to weave tangled webs that destroy trust and relationships. Through my Stop Compulsive Lying Hypnosis MP3 the compulsion to lie is replaced with the ability to tell the truth. Compulsive lying is not done merely to deceive. Often people will tell lies to save themselves from embarrassment or prevent hurting another’s feelings. They will even lie for financial gain or as part of their “sales pitch.” With compulsive lying the lies are told for different reasons or no reason at all. The reason or lack thereof is the core problem that hypnosis seeks to correct. Compulsive or chronic lying is actually believed to be a symptom rather than a mental disorder of its own. It could be symptomatic of narcissism or delusional thinking, in which case the lies that are told by the liar are reality to them so they are unaware that they are lying. Hypnosis can make reality a more conscious part of the compulsive liar’s thinking. It does this through a therapeutic script that allows for better organization of data that is real and that which is merely perceived by the liar. Chronic lying usually begins in childhood. It is around age 5 or 6 that children tell lies to avoid punishment or having to do something they don’t want. All parents have heard their child state clearly they have brushed their teeth, only to find a dry toothbrush in the holder. It is when this habit continues into adolescence that there may be another disorder assigned to it, since at this age young adults begin to truly understand the consequences of lying. Steve G. Jones is a clinical hypnotherapist who has helped compulsive liars gain a firmer grasp on reality. His self hypnosis program, Stop Compulsive Lying Hypnosis MP3 can effectively change the outward responses of the person with the disorders related to chronic lying. DO SOMETHING FOR YOURSELF TODAY…END THIS COMPULSION TO LIE ONCE AND FOR ALL…BEFORE IT ENDS YOU !!!! !It’s easier than you think. You’ll see a new you and you’ll feel great about it!!! Steve G. Jones, Ed.D., Clinical Hypnotherapist, charges $1,500 for a custom recording and $25,000 for a one-hour private hypnotherapy session at his office. But you can get all the benefits for this low price. Simply listen to the Stop Compulsive Lying Hypnosis MP3 download every night as you go to bed for three weeks and feel the changes happening in your life. You will feel more empowered, more in touch with your true self, and you will truly know that your goals are within your reach. Steve G. Jones achieves AMAZING and LASTING results!!! Hypnosis is the easiest way to affect change in your life because the positive messages go straight to your subconscious mind effortlessly so you can accomplish your goals and reach for the stars!! All you have to do is listen to the Stop Compulsive Lying Hypnosis MP3 audio at night as you go to sleep!!! You’ll hear soft music, the gentle sounds of the beach, and the soothing sound of Steve G. Jones’ voice all working together to bring about positive changes in your life easily and naturally. Steve G. Jones has been helping people improve their lives with hypnosis for over 17 years…now it’s time for him to help YOU… don’t wait, do it NOW !!! you’ll be glad you did. See you at the top! And as you continue relaxing deeper and deeper and more deeply relaxed, you realize that you are a person of integrity. You are a very powerful wonderful person, a person full of integrity and you desire to live a life in which you tell the truth. Because you realize that in telling the truth, you honor yourself and others. And you desire to honor yourself and others. So you constantly tell the truth. You are honest. You are very honest and you see that it makes perfect sense to be honest. You realize that there is immense power in honesty, that’s right. And you choose to have this power, the power of being honest and realize that day by day, it will become easier and easier for you to become honest, easier and easier for you to be a person of integrity. So relax now and realize just how powerful your mind is and it has the ability to allow you to always tell the truth, that’s right. So relax now and be happy because you are an honest person, full of integrity and that feels so good. Compulsive lying is a habit, a bad habit that you must and can break with the help of hypnotherapy. As you probably already realize, lying can get you into a lot of trouble. Lying also involves a lot of extra effort on your part. You have to come up with something that never happened and this can often get you into trouble. Also, it is important to realize that other people can sometimes see through your lies. You have probably figured out what people in your life have figured you out and you no longer want to hurt them. Realize that there is no need to lie. You can live a fulfilling and happy life without depending on white lies and half-truths. Hypnosis re-directs your line of thinking. Instead of creating a lie, you will be more influenced to tell the truth. You simply will not see a need in lying after listening to the Stop Compulsive Lying Hypnosis MP3 program. Your subconscious mind will be programmed so that lies do not appear in your mind any longer. Instead, the suggestions in this hypnosis recording will encourage you to either speak the truth or say nothing at all. 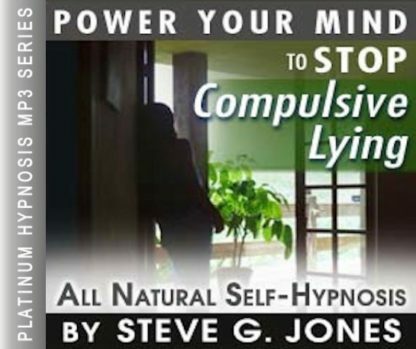 We suggest that you listen to the Stop Compulsive Lying Hypnosis MP3 audio for 21 nights in a row before going to bed. You may also need to listen to the recording once a week or once a month as needed after you have finished the program as a maintenance plan. You can stop compulsive lying. It is a bad habit that you can easily break with this self-hypnosis program. We encourage you to use hypnotherapy to stop your habit of lying.